Not sure where to head to during the weekend? 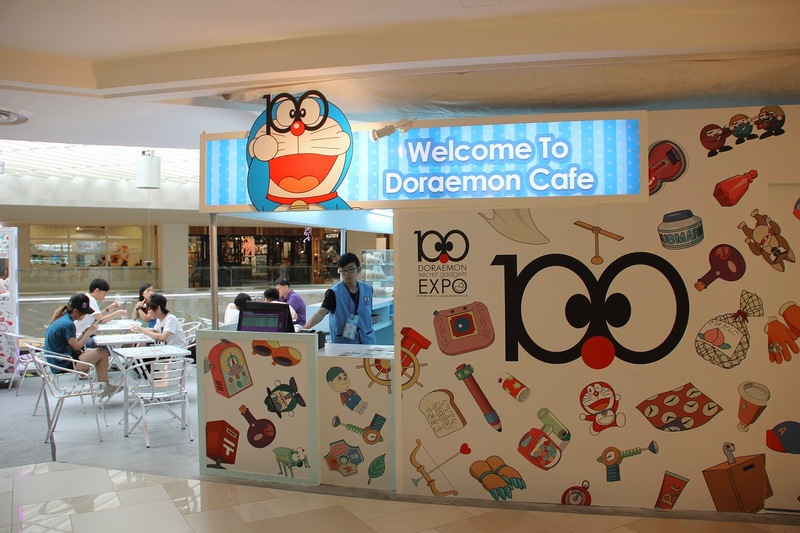 Perhaps you could head across the Causeway to JB City Square Mall Level 1 for the 100 Doraemon Secret Gadgets Expo. 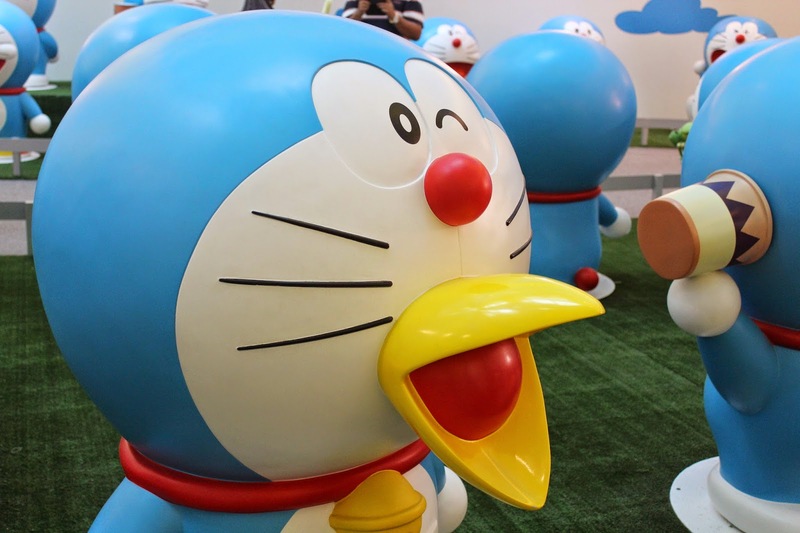 On from now till 4th Jan 2015, the 100 Doraemon Secret Gadgets Expo showcases 100 life-sized Doraemon figurines, 100 iconic gadgets and memorable scenes in Doraemon stories. 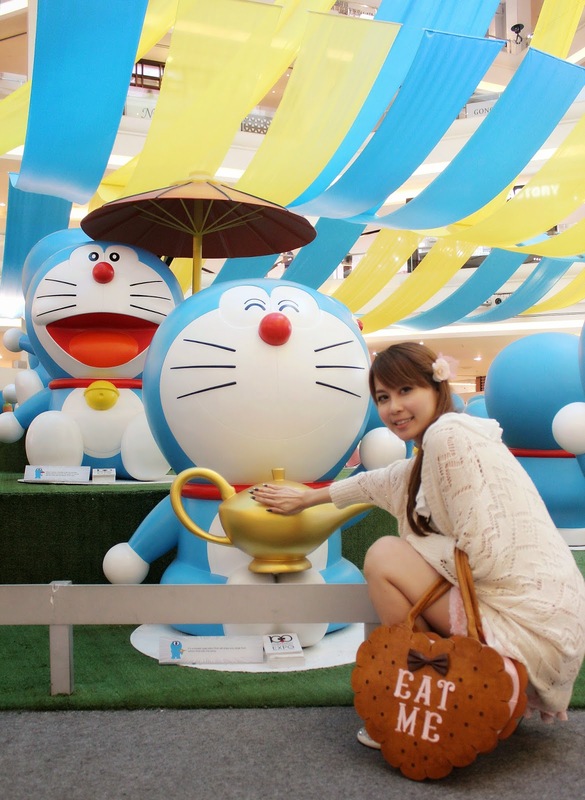 Even if you're not a Doraemon fan, the photo opportunities and interesting gadgets will certainly blow your mind. If you have kids in tow, I'm sure they'll be just as, if not more entertained! Tickets are affordably priced at RM25 for adults (aged 13 and above) and RM15 for kids (aged 4 - 12). Senior citizens and very young children (below 90cm) can enter for free too. You can literally find a Doraemon in every nook and corner, and if you follow the comic series, you can probably identify most, if not all of the gadgets. 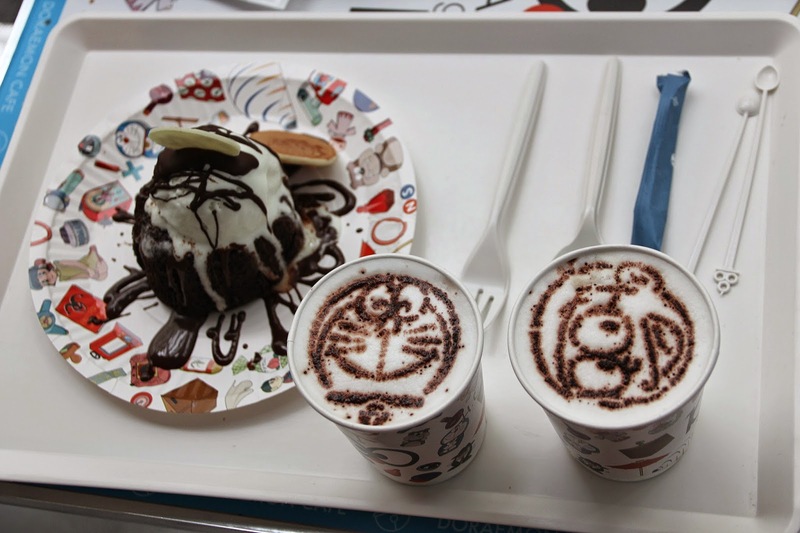 For Doraemon lovers, this is definitely a feast for the eyes. Karen, Janice, Raphael and I headed to the expo on a Saturday afternoon. 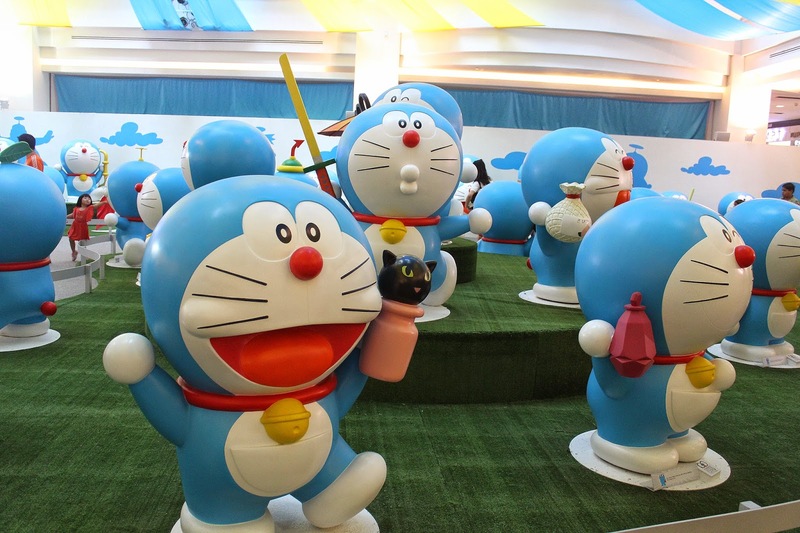 We had so much fun goofing around with the Doraemon figurines, toying with all the fanciful gadgets and discovering new, fascinating facts about Doraemon. Did you know that Doraemon is a cat with ears that used to be yellow? I had absolutely no idea! An unexpected twist of events led to Doraemon losing its ears to a mouse. This incident scarred him for life and caused him to fear mice. How did Doraemon become blue then? 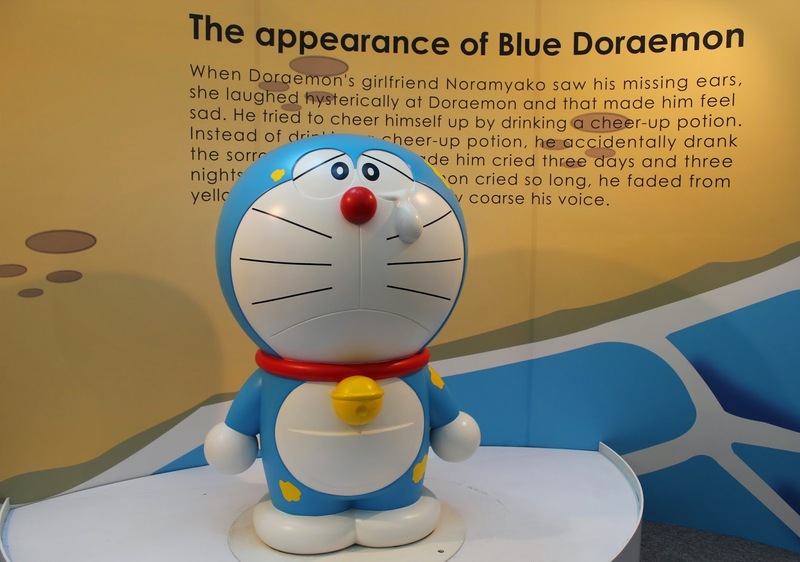 Poor Doraemon tried to cheer himself up when his girlfriend Noramyako laughed at his missing ears, but instead of drinking a cheer-up potion, he drank a sorrow potion that made him cry for 3 days till he eventually turned blue! 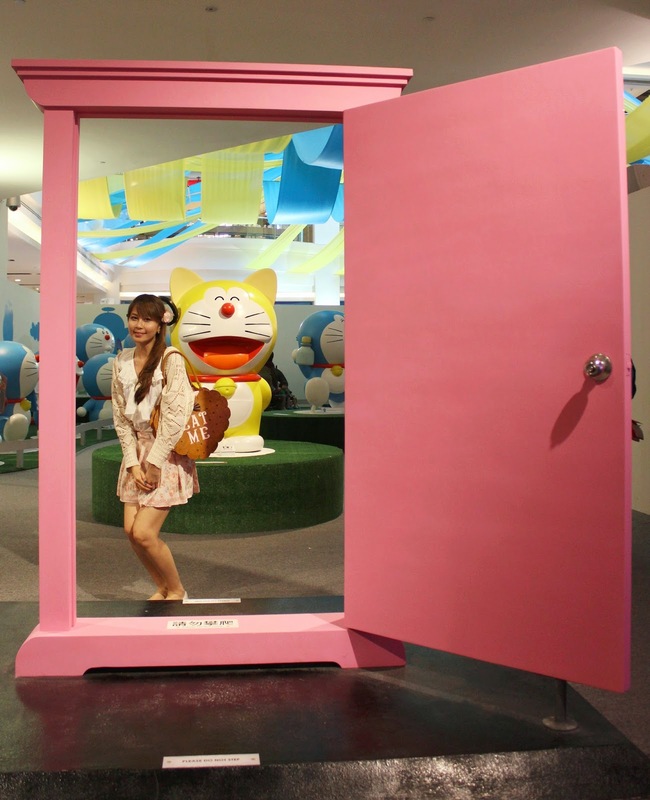 At the entrance of the expo, you will find the "Dokodemo Door", which allows you to travel anywhere simply by walking through the door. The "Time Machine" is another popular gadget at the expo. I love how the psychedelic lights create the illusion that you are travelling through time and space. Anyone who has caught an episode of the Doraemon cartoon would find the "Hopter" familiar. I used to wake up early every Sunday morning just to catch Doraemon at 9.30 a.m. and the "Hopter" is one gadget that left the deepest impression on me. This bamboo propeller is meant to airlift you to safety but it looks more fun to me than anything else. I would love to be able to fly from one destination to the next just by attaching the "Hopter" to my head! Want to take a peek at what everything looks like in a 100 years' time? 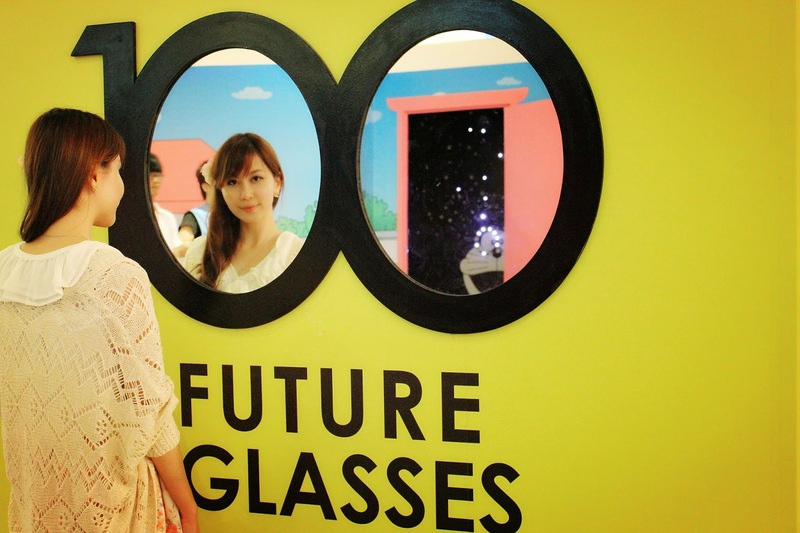 Place the "Future Glasses" in front of your eyes for a sneak preview! The "Air Cannon" creates a powerful burst of air that can easily knock out your enemy. All you have to do is attach it to your hand and say "Bang". Finally, here's a weapon that doesn't run out of bullets because it doesn't require any! Having difficulties memorizing your notes for tomorrow's exam or your speech for an important event? Here comes the "Memory Bread" to the rescue! Place the bread against whatever you need to memorize, and a special mechanism in the bread will store all the information required. Thereafter, eat up the bread and everything's stored in your memory! If only this exists in reality. I would buy a loaf of this bread everyday. Want to experience a day in the life of a Lilliputian (for those of you who've read Gulliver's Travels)? 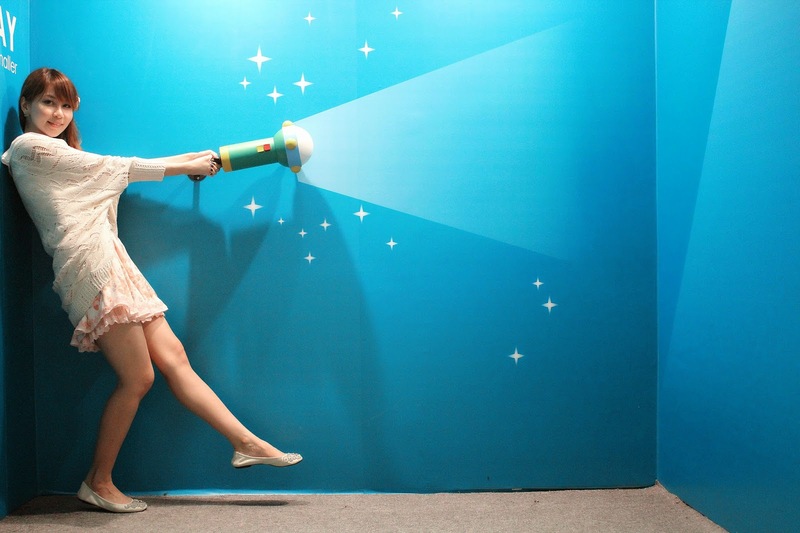 You could jolly well fulfill your dream with the "Small Light", a device that shrinks people and objects. Besides these popular gadgets, there many other interesting gadgets that double up as great photo backdrops. Doraemon first popped out of a drawer in Nobita's bedroom, catching him by surprise. 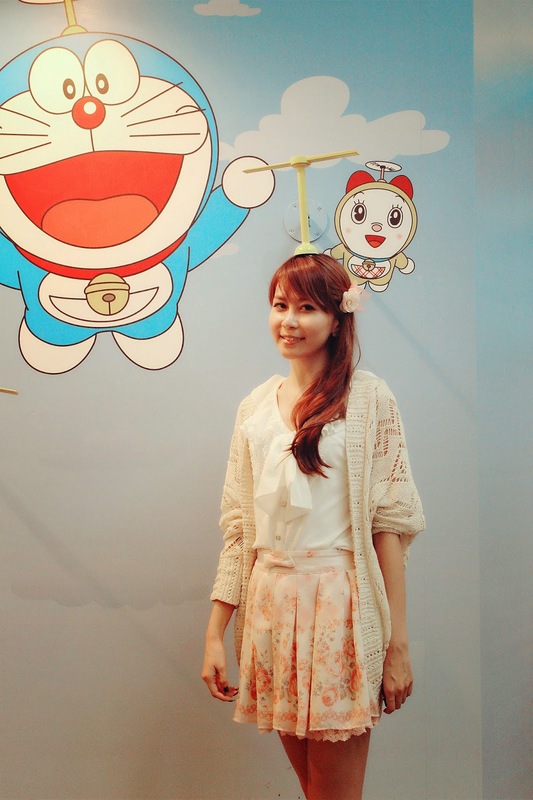 Doraemon fans would know that Nobita always had a thing for Shizuka. The pair did eventually end up together. The teddy bear in the photo below was a precious gift from Nobita's grandmother. Nobita found the teddy bear in his stash of old belongings and it reminded him of how much he missed his grandmother, hence he asked Doraemon to take him back to three years ago when his grandmother was still alive. 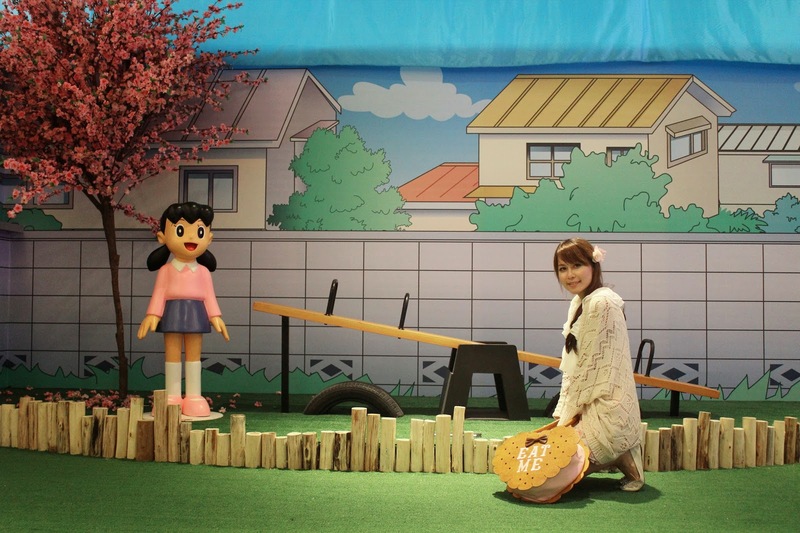 A new scene at the Doraemon expo, fans can expect to sit in Nobita's class, which comes complete with a teacher and blackboard. 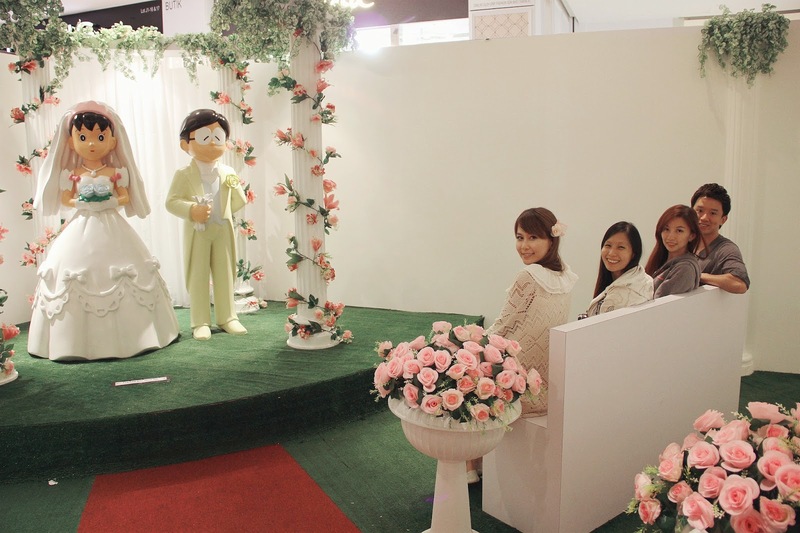 You'll also get to meet many of Nobita's friends during the expo. The numerous photo-taking opportunities made the entire experience an engaging and interactive one. 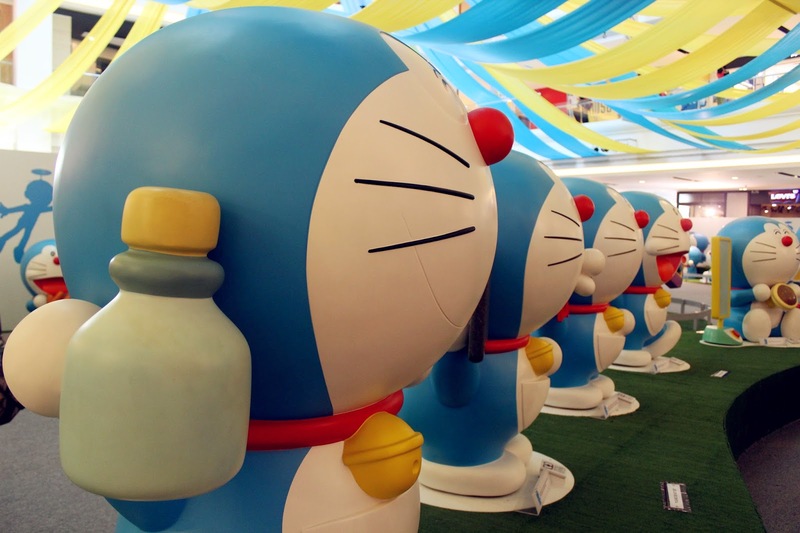 Suitable for all ages, the Doraemon expo provides a great opportunity for family bonding and for friends to get together. It was a fun-filled afternoon for all of us and we had a marvelous time snapping away. Much thanks and love also goes out to Janice for being my personal photographer this time! 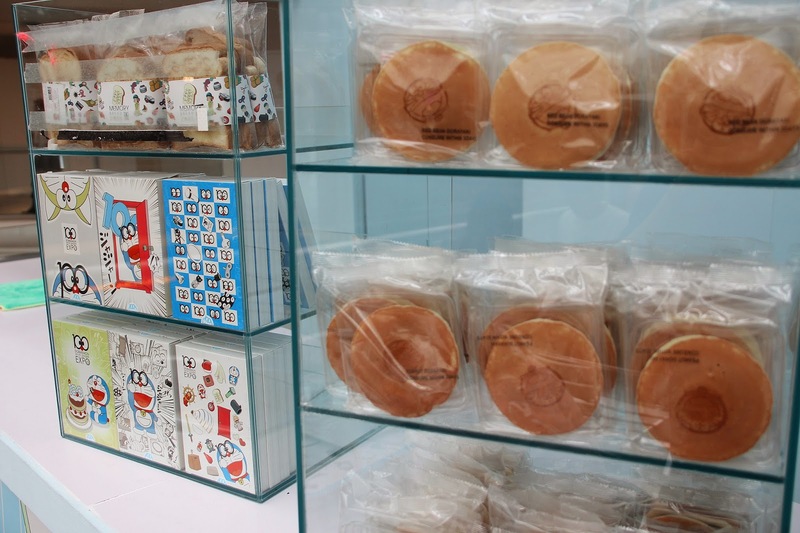 And if you still haven't had enough of Doraemon, you can pop by the Doraemon Cafe located on Level 1 (Atrium) and Level 5 to try out Doraemon's favourite snacks! Many thanks to Alvin for sharing the cafe photos with us!